During the celebration of Dia de los Muertos (the Day of the Dead), sugar skulls are often used to decorate the ofrendas (offerings), and they are exactly what their name describes: skull-shaped sugar. 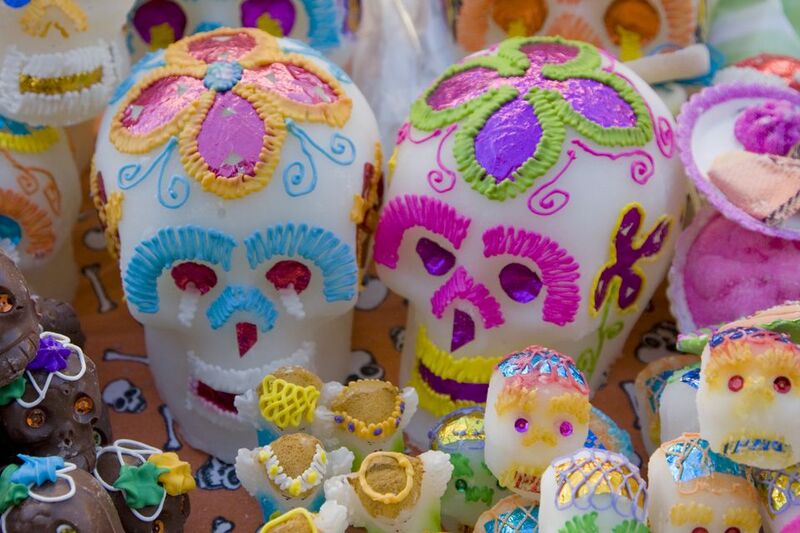 Traditional sugar skulls are made from a granulated white sugar mixture that is pressed into special skull molds. The sugar mixture is allowed to dry and then the sugar skull is decorated with icing, feathers, colored foil, and more. While the ingredients of sugar skulls are edible (with the exception of the non-edible decorations you may add), the skulls are generally used for decorative purposes. There are some small sugar skulls, however, that are made with basic icing and are intended to be consumed. Be sure which one is which before taking a bite! Dia de los Muertos was an Aztec ritual that celebrated the lives of those who have deceased. The Spaniards who invaded Mexico tried to eliminate this month-long holiday with no success. Dia de los Muertos was eventually merged with the Catholic All-Saints day and All-Souls day on November 1st and 2nd in an effort to make the holiday seem more Christian. According to Angela Villalba from the Reign Trading Co., sugar art dates back to the 17th century when Italian missionaries visited the New World. Mexicans during that time period had very little money and learned from the Catholic friars how to make decorations out of an ingredient they had plenty of—sugar. Molds were made of clay and the sugar decorations were used to adorn the church, gravestones, and the ofrendas (the collection of objects placed on an altar for the holiday) for Dia de los Muertos celebrations. Smaller skulls are placed on the ofrenda on November 1st to represent the children who have deceased. On November 2nd they are replaced by larger, more ornate skulls which represent the adults. These decorative skulls have the name of the deceased on the forehead and are decorated with stripes, dots, and swirls of icing to enhance the features of the skulls. These designs are usually whimsical and brightly colored, not morbid or scary. Feathers, beads, or colored foils are "glued" on with the icing to create highly ornate skulls. Some companies manufacture small, edible skulls to be eaten during the holiday and many artists sculpt, paint, or otherwise create beautiful and ornate skulls to be used as decorations, jewelry, and anything else you can think of! Sugar skulls can be made by anyone and are a wonderful addition to any Day of the Dead festivity. They make a great craft project, too! You can also purchase blank sugar skulls from Reign Trading Company that you can decorate yourself or you can order small, medium, or large sugar skulls from MexGrocer that are pre-decorated for you. Please note that some of the decorations (foil, sequins, etc.) are not edible and must be removed before consumption.